Many business premises across the UK are characterised by aluminium, copper or steel powder-coated cladding panels which can become dirty and tired looking over time. 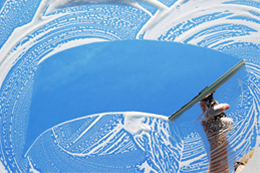 This does not serve to give a good impression of the business to visitors or clients so a good maintenance schedule is recommended to keep the building looking at its best. More concerning, if left untreated these panels can become permanently discoloured or corroded which can lead to expensive remedial works. Many cladding panels are either painted, anodised, plastic coated or powder coated, so permanent damage to the panels can only be rectified by costly spray painting or complete replacement of the panels. By maintaining a clean and well preserved surface on cladding, businesses can hope to reduce long term maintenance costs and minimise any potential disruption to the operation as well as keeping the premises looking fresh and inviting, projecting a positive image of the company. 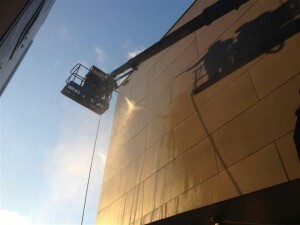 Using high level abseilers and/or MEWPS or even the high tech Reach and Wash type system Cardiff Commercial Window Cleaners can perform effective cleaning of high level cladding, copper cladding, all types of roofing materials, K-Render or plain render & just about any other surface you can think off, cleaning it in a safe and hassle free manner. Fully trained IPAF operatives ensure the cleaning techniques are applied effectively and efficiently to ensure you receive the best value for money and the best result possible. Our fully comprehensive insurance and up to date health and safety site specific RAMS (Risk Assessment & Method Statements) gives our clients peace of mind that this specialist operation is committed to delivering a professional service and a high quality finish. Clients choosing to employ us can be safe in the knowledge that their cladding, fascia’s and soffits will be left free from dirt and in the best condition to ensure their life expectancy is maximised. We also actively carry out Builders cleans, all staff carry CSCS & PASMA cards and IPAF licence holders, we work with Lauren Carter, Savills, Rightacres, Bect Builders, Browns Construction & Dawnus to name a few. All site specific RAMS supplied as part of procurement of the contract. Contact us today for a free ‘no obligation’ quote.